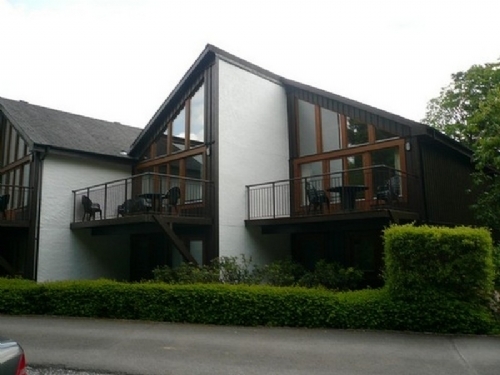 This scandinavian lodge has two bedrooms and is only a five minute walk from the town of Keswick. The bedrooms are on the ground floor and the open plan living area is on the first with a balcony. A lovely base for all there is to see in the area. 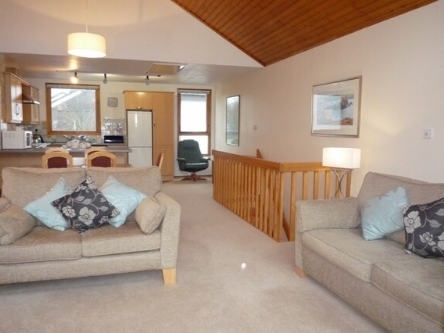 Two ground floor bedrooms: 1 x double with en-suite bathroom, 1 x twin. Bathroom with shower, basin and WC. First floor open plan living area with kitchen, dining area and sitting area with pull-down double bed and balcony. Shared utility. Hallway with heated drying/storage cupboard. Ideal for families or groups of friends. Electric heaters. Electric cooker, microwave, fridge/freezer, shared utility with washing machine and tumble dryer, dishwasher, TV with Freeview, WiFi. Bed linen and towels inc. in rent. Parking on-site for 2 cars. Balcony. Shared grounds with children's play area, river and woodland. Sorry, no pets and no smoking. Shop and pub 5 mins walk. Note: Due to balcony in property and river in grounds, children must be supervised at all times. Note: Check-in time 4pm. Please note fuel and power chargeable on departure.